Single-cell mechanics measurements are crucial in understanding mechanotransduction and cellular properties, such as adhesion and stiffness. Here, we present a microfluidic probe device that can generate controlled hydrodynamic loads on single cells in an open cell culture environment. The device is optimized to produce uniform stresses across the area of a cell for cell adhesion measurements. 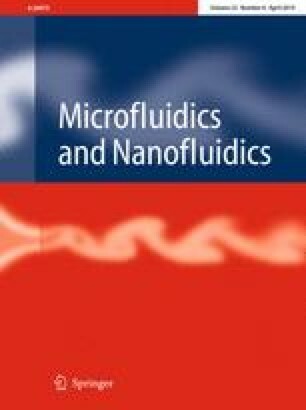 Microfluidic probe (MFP) devices that can be used to create hydrodynamically confined flows (HCMs) have emerged as a unique device for selectively treating cells and surfaces. Typical MFP devices generate complex-shaped flows and non-uniform hydrodynamic loads on the surface beneath the device. We have used computational fluid dynamics to optimize the port geometry of the MFP device to generate an HCM with uniform shear stresses in a region beneath the device. The devices were fabricated from a combination of silicon and PDMS and characterized through flow experiments above a polyacrylamide gel seeded with fluorescent beads. Bead displacements were measured as a function of flow conditions and general agreement with the model was obtained. Finally, we have used the devices to characterize the adhesion strength of patterned fibroblast cells adhered to a collagen-coated substrate. The results presented establish a design for an MFP device that can apply controlled mechanical forces to cells in open liquid environments. We acknowledge financial support from a 3M fellowship, the Wisconsin Alumni Research Foundation, and NSF award 0832802 at the University of Pennsylvania. Finally, we thank Dr. David S. Grierson for assistance in performing the AFM measurements on the polyacrylamide gels. K.S.M. acknowledges support from NIH R01 HL093281.